Periscope Likes To likes can run on the account must have at least one active video! Periscope is a relatively young application. Its users conduct online broadcasts of important moments of their lives, share interesting video reports on a variety of topics, demonstrate their work in real time, and the particularly important part for promoting business or any project in Periscope is followers and likes. The algorithm of this application is based on the distribution in search of online broadcasts, i.e. the content posted by one user is shown to his followers, then to subscribers of those followers, etc. 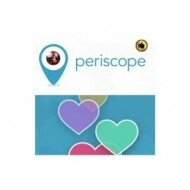 Therefore, their load-up is the most effective way to monetize the profile in Periscope. The problem of additional followers and likes can be solved as quickly as possible with the help of Smmlaboratory.com. We use only proven effective methods to drive up followers and likes in Periscope. We stick to the rules and conditions of the social network, so when ordering the appropriate service on Smmlaboratory.com you will like our attitude for promotion. Loading up followers and likes in Periscope with our assistance will be inexpensive, but will provide an opportunity to acquire a lot of new viewers, fans, to maximize business promotion. Thus, the creation of a Periscope profile, followed by followers load-up is the best solution for advertising of a startup and promotion of the a new company when a full-scale advertising campaign is not affordable. Of course, you can try to drive up promotion via followers and likes in Periscope by yourself, but it will take a lot of time, which can be spent with greater benefit for your project. Entrust this mechanical monotonous work to a third party, which can always be performed by our service. Here you can order a load-up of live followers and real likes, including specific criteria (country, gender). Use Smmlaboratory.com and be sure to be seen, heard and liked.